Welcome to emergency mode! After logging in, type "journalctl -xb" to view system logs, "ststemctl reboot" to reboot, "systemctl default" to try again to boot into ddefault mode. 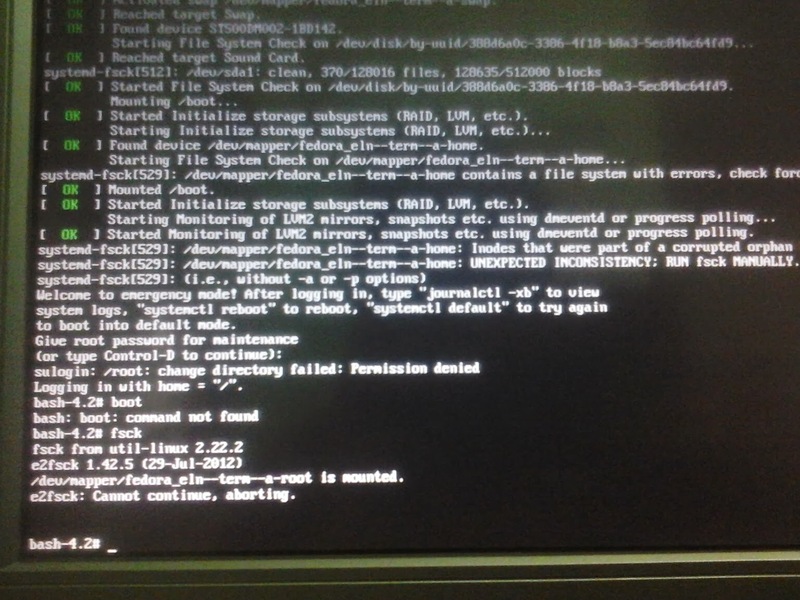 Solution #3 allowed me to fsck root under Fedora 20 (I didn't try the other 2 solutions). Thank you! Only note: I found that steps 2-3 were not necessary since the 'fedora_XXX-root' was not mounted after booting with the Live Desktop DVD. Solutions 1 and 2 didn't worked for me because it was impossible to unmount /dev/mapper/fedora--root. So the solution was to boot on Ubuntu with an USB key. However, my disk was LVM formatted so I had to follow the steps here : http://www.linuxquestions.org/questions/fedora-35/how-can-i-mount-lvm-partition-in-ubuntu-569507/#post4039648. I was then able to run fsck on /dev/mapper/fedora--root to correct the errors. I have faced this problem when there was a power failure with my desktop updating fedora 20 x86_64. 4. Run the gui gparted application. 7. After the process is complete shut down the system and boot as usual. 8. Enjoy fedora again.. ! Solution #3 worked for me. I operate my Fedora 20 from VMware and I booted from the LiveDVD iso file. I had to modify the BIOS settings to boot into the DVD. After fixing the solution, I had to edit the BIOS again to boot to Hard Drive. Once that was up, I checked the visible disks (using Disks), but only fedora-swap was mounted. Everything else was part of the active 'live' session. fsck /dev/mapper/fedora-root, and a bunch of "y"s fixed it. You my friend, are nothing short of awesome! Solution 3 worked well for me. Awesome !!! Thank you !! I follow Step 1, I had to let my finger pressing y during 15 minuts to fix all the bugs and corrupted files... AND IT WORKS !!! Thank you so much !! Thanks so much. Solution #2 worked for me. Entered into emergency mode but now I got my Fedora 27 back and working well. Thanks God and thanks to you.